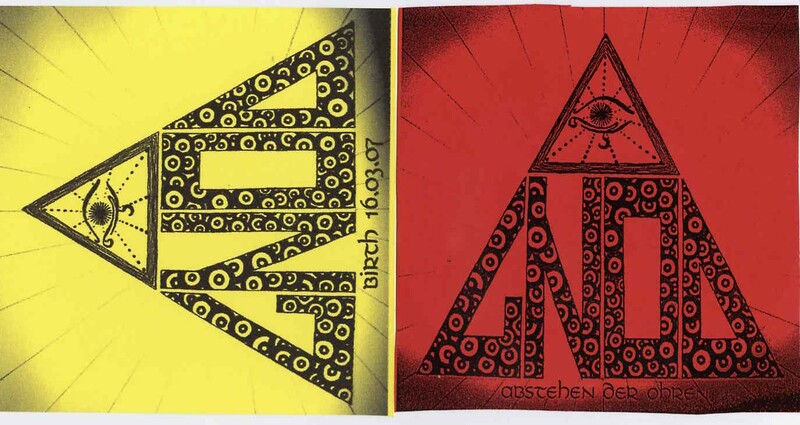 Gnod is a new group from England that are really into some far out stuff… This demo CD features 6 tracks in 47 minutes. The title track is a suite of 4 tracks. The music is a mixture of repetitive grooves with samples mainly bass, drums and keyboards. The bands music is mostly improvised, dreamy, droney and sometimes far out. This material was recorded live to mindisc according to the bio on myspace. Anyway, Astehen begins to melt into outer space bliss around 5 minutes and then falls quite quiet. The 3rd part starts with the sounds of feedback, multiple rhythms on strange cans and drums or whatever as the heavy bass and feedback builds. This piece reminds me a lot of Circle from Finland. The ending piece goes back to the melodic way the piece started (may even be the same piece sampled again). Hippydrone is next and a short noisy drone piece with some far out stuff going on. Liked this one a lot. 24 minutes over Manchester ends this demo CD. This track starts slowly with some drums playing and an electronic drone slowly taken building and morphing as the drums are slowly mixed louder. Around 7 minutes the main drone fades and another begins to take over in another direction, until the piece becomes almost ambient but quite mysterious. Some piano filters into the track 14 mins or so in and the track becomes more melodic. IT ends totally spaced out.. Cool stuff.